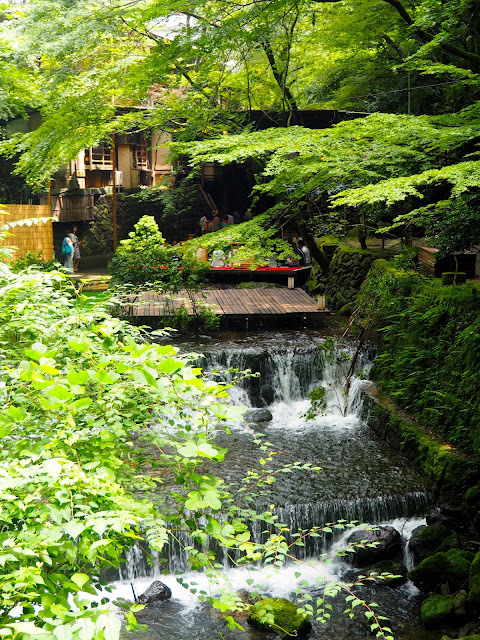 Kyoto has a wealth of temples, shrines, museums, and more, to be explored. After two full days in the city though, and reaching my tolerance level for temples, I was ready to venture further afield once more. Kansai is a fairly easy area to move around in, with dozens of train lines cross-crossing the region - again, this is why I skipped the JR Pass, since a lot of these are local lines that wouldn't be covered by it. It's also not a huge region, so the trips I took were each less than an hour away, allowing me time to sleep in or come back early and still see plenty. For one day, I decided to go to Nara, which is frequently recommended in every guide to the region, and for the other I tackled the hike between Kurama and Kibune, to make a change from all the temple-hopping (though there were still shrines along the trail). I got up mid-morning and made my way to Kyoto Station, just ten minutes or so from the hostel. There are two lines that go to Nara, the JR or the local line, the latter of which has express and limited express (fewer stops) options. I took the local express, it being the cheapest of the ticket options, and it took me to Nara in about 45 minutes. 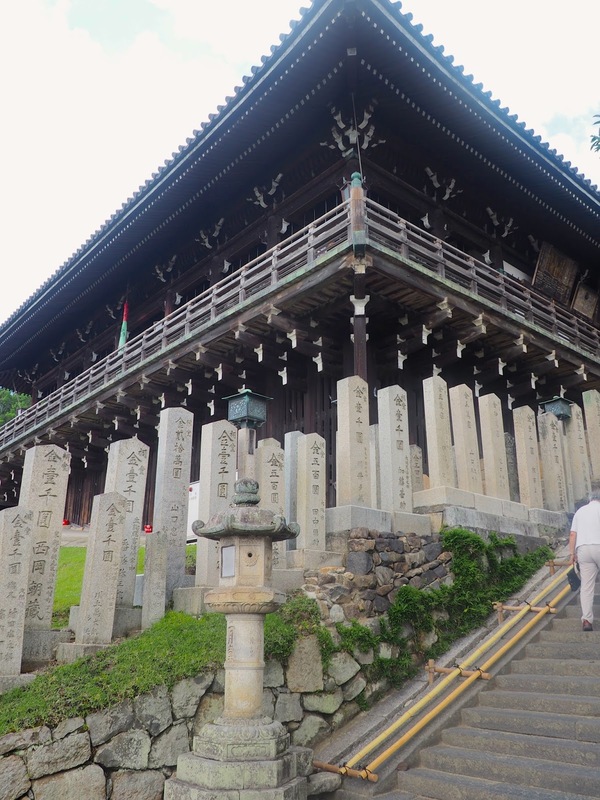 My first destination was Nara Park, as that's where the majority of the towns sights are, with several temples and shrines scattered throughout it. As I was making my way towards it though, I was greeted by another of Nara's most famous sights; its population of deer! I knew they would be around but I wasn't prepared for just how many there would be. Later I learned that there are over a thousand deer living in the town. They are considered sacred, because of a god who visited the town riding one. The deer roam wild, but are well accustomed to the people passing by - you can even buy 'deer cakes' from vendors to feed to them, and they'll come searching for the food immediately! I continued into the park, veering left first to begin looping round it. I stopped at Yoshiki-en Garden first, which is free to enter for tourists. There's another, slightly larger, ticketed garden next door to it, but I skipped that one. Yoshiki was quite forested, with paths winding through the trees. 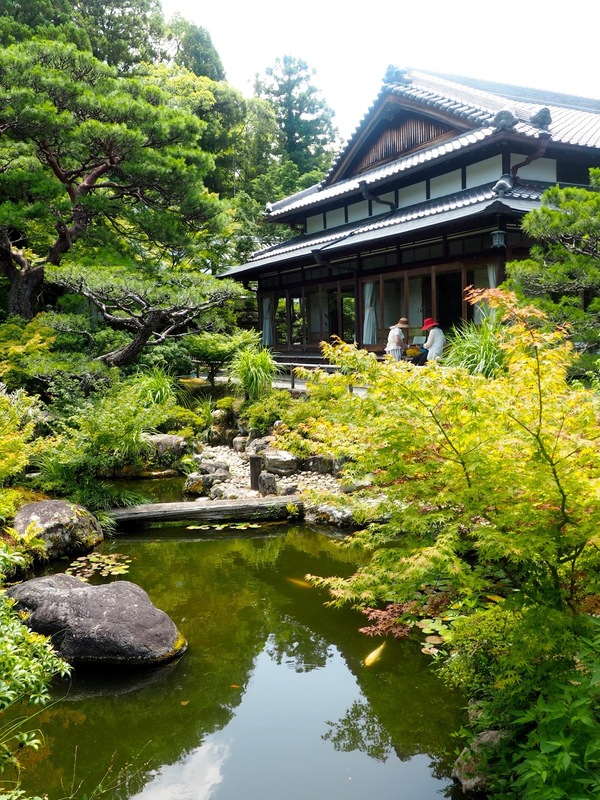 There was a small pond and tea house as you entered, then a moss garden, which was a large open area, covered in, you guessed it, moss. I suspect it would've been even prettier a month or two ago, with flowers and blossoms, as it was al green now in the summer, but it was a nice wander through. Then I bypassed the other garden, and continued round the back road to the park, towards Tadai-ji Temple, the biggest one in the park I think. There was an entry fee for the hall, though I skipped the combo museum ticket, and then you entered the courtyard. All the Japanese shrines and many of the temples have small fountains just outside them, with cups on long handles, for washing yourself before entering, if you wish, something I haven't seen anywhere else. I haven't bothered at most I've visited, but it's an interesting custom. The main hall is Daibutsu-den, or 'Great Buddha Hall', and the statue of the Buddha inside it is truly one of the largest I've seen (inside a temple anyway). The shrines here have statues of other gods, from Shintoism, and are sometimes quite small, which has made a change for me, since I've seen so many Buddhist temples before, so seeing such a huge Buddha statue again was actually a bit surprising! 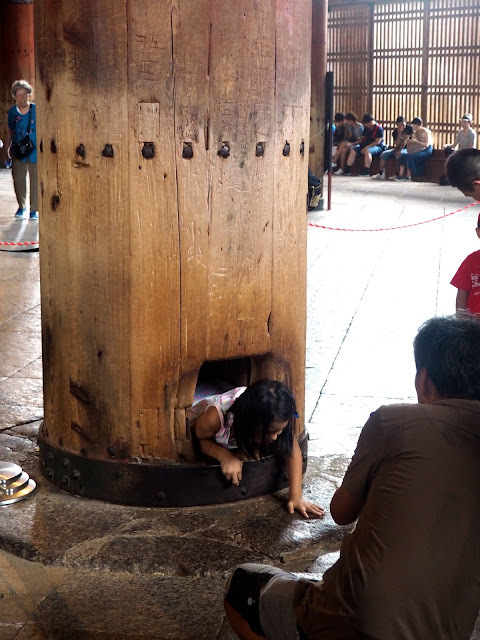 I made my way around the temple, with more statues around the main one, and I particularly enjoyed watching children crawl through the hole in one of the pillars! There is also another statue outside of Binzuru, a Buddhist Arhat, and supposedly if you touch part of his body, then the same part on yourself, you'll be healed of your ailment. I carried on around the park, next reaching Ningatsu-do Hall. I liked this one a lot, having to climb up the steps to its position on the hillside, and all the stones lining the staircase up to it. There was also a rest area inside, with free drinking water available - a welcome change from having to buy bottles from vending machines all the time. Actually, there's a thing I haven't mentioned, Japan is obsessed with vending machines! They are absolutely everywhere, which is handy when you're thirsty sure. The park was full of them, mostly selling different drinks. I have encountered some with hot drinks or ice creams, and apparently there are even some serving whole hot meals, particularly ramen. Anyways, from there it was a longer walk to the next temple, passing several small shops and restaurants - as well as plenty more deer! - along the way. Not going to lie, my feet have been hurting from the amount of walking I do each day! 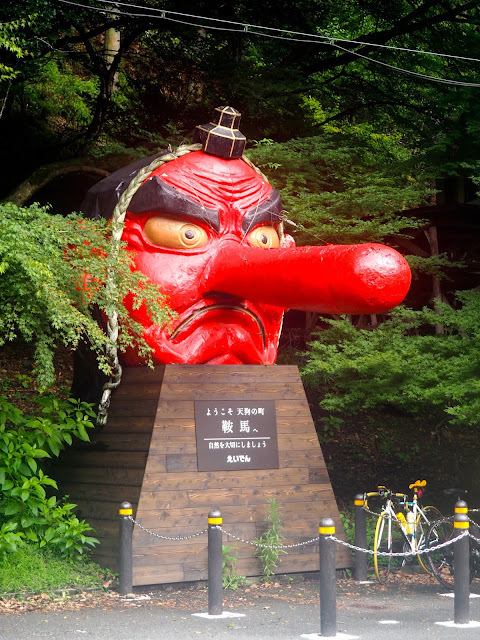 Next was Kasuga-Taisha shrine, which saw a return to the bright vermillion decor of Shinto shrines. Only a small portion was accessible for free, with a ticket required to go further inside - seeing as there was so much else to see in the park, I settled for just the free area, which allowed me to see enough to satisfy my curiosity. The pathway then took me back in the direction of the park entrance, as I followed a long, stony path, lined with stone pillars. It led through more fields of deer, at which point I took a break with a vending machine coffee, to rest my feet and watch the deer for a little while. The last temple in the park was Kofuku-ji, but the central hall was closed for construction, so there was a limited amount to see. There are some pagodas and octagonal halls around it, which I wandered past, before taking a side exit out of the park. I still had a bit of time left in the afternoon, so rather than shoot straight back to Kyoto, I explored the Naramachi area of town nearby. There's a large pond just beside the exit I had come out of, which I walked around before delving into the streets. Lots of the buildings here are traditional in style, with lattice work fronts, the most notable being Koshi-no-ie house. Some of them are traditional houses that are no longer inhabited, but instead are open to tourists, but as I'd already been around places similar, I didn't bother. Instead, I just photographed their exteriors, as I slowly ambled through the streets. 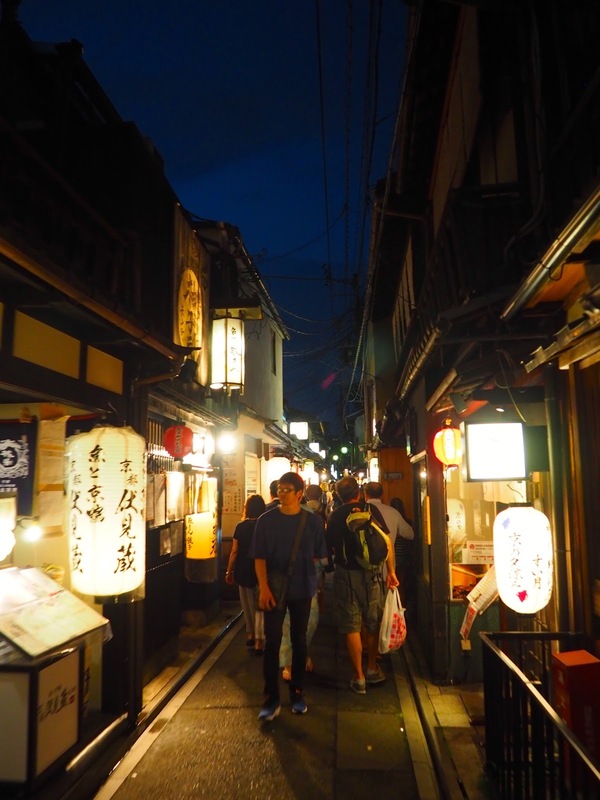 I circled back through a covered shopping street, having a quick browse as I went, before eventually returning to the train station and heading back to Kyoto. The hike from Kurama to Kibune was on my list to do one day since the beginning of the trip, but the weather had forecast rain every day, so I left it until the end, hoping the rain would pass by then. Unfortunately that wasn't to be, and the night before it rained heavily, with the next day's forecast predicting more that afternoon. The morning looked clear though, so I got up early to start the hike. It only takes around two hours, so it's possible as a half day trip, but had the weather been different, I'd have slept in and filled my afternoon with it instead. Anyways, I took the Eizan Kurama line to its terminus, the tiny little village out in the countryside. 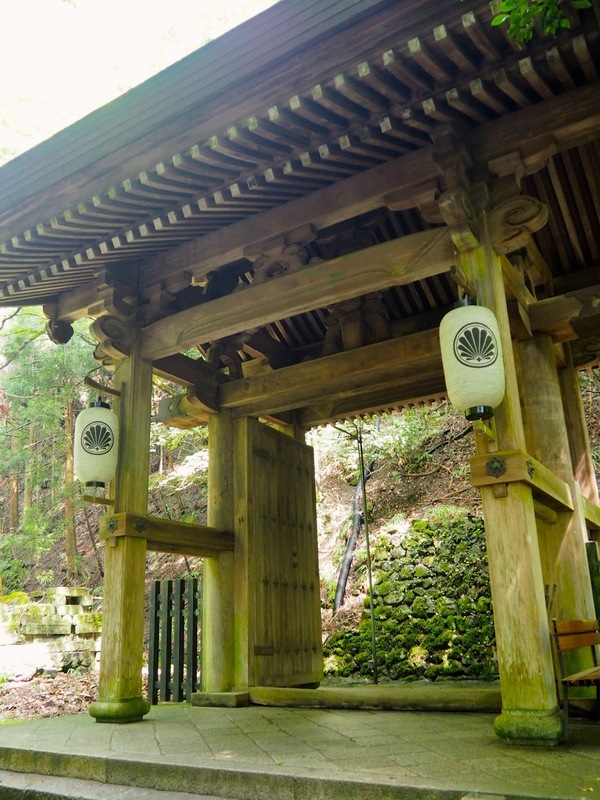 The hike starts by a temple, and there's a small entry fee to pay. At first you follow the 'worship route' up the hillside, past more small shrines. 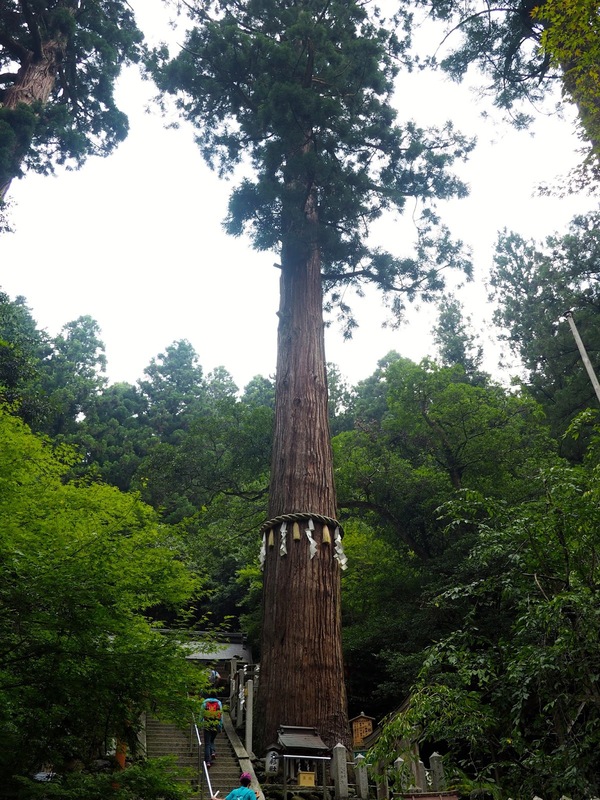 There's a huge pine tree, Kitayama Sugi, in the centre of one of the paths, with special decorations (found in many temples here) hung around it. As the hike continued uphill, I passed more shrines, wooden gates, and a few interesting sculptures along the way. All the signage was in Japanese, so I didn't know what any of them were as I went, but I was using this web page as my guide to not take any wrong turns, which has a little information about each of them. Much of the route is shallow stairs, which get a little steeper towards the top. Eventually I reached Kurama-dera temple, which I spent a few minutes taking a look around. There is some view of the surrounding country too, but it's mostly just hills covered in trees. Then it wasn't too much further to the summit, as I followed the path around the back of the temple and past the fossil museum (the internet said I probably didn't need to bother venturing inside!). Around here there were warning signs about bears too, which was a tad disconcerting when I was on my own! There were a few other people on the route, but not always around where I was. Fortunately I didn't see any though, and it wasn't too much further until the highest point, marked by a standing stone. The path back down was mostly stairs again - which my knees were not thanking me for by the end of! There wasn't very much of interest to see, other than another shrine, and there seemed to be more people on the way back too! The shrines were much simpler than those in other places, small stone structures amongst the trees, so it was interesting to see that contrast anyway. Eventually the stairs led down to a road, next to Kibune village. There were lots of restaurants along the river, which many people were choosing to visit following their hike. It was pretty busy though, as there were definitely plenty other visitors besides hikers, so I decided to wait until I got back to Kyoto. It took me a while to figure out how to get back to the train station, as it's not actually in the village, as it was in Kurama. Instead (thanks to my map), I had to follow the road for a good 20 minutes or so, downhill until I eventually got to the station. From there, it was about half an hour back to the city. I wandered around briefly, stopping to get some food and coffee, before the rain eventually decided to arrive - perfect timing really! After three and half days roaming Kyoto and Kansai, I was ready for a rest, so I was quite happy to unwind in the common room back at the hostel for a while - and I needed to catch up on blogging! Later, I ventured out one more time, heading back to the downtown area of the city. I was wandering along the same shopping street as I had a previous day, but now the lanterns above the pavement were lit. Unfortunately, I forgot it was a Saturday night and it was very busy, which made me start to lose patience quickly. I grabbed some food on the go, then had a quick look along Pontocho Alley, a narrow street by the river full of restaurants. I wasn't stopping to eat in any of them, but it's quite atmospheric down there at night, with the lanterns and wooden shop fronts, all squeezed together in the dark. I didn't linger, as it was tight with people too, but it was nice to have one last look around Kyoto, before my departure the next morning.